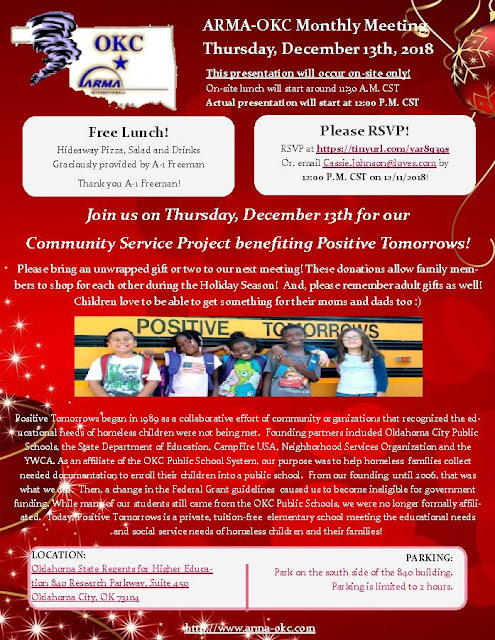 Please RSVP before 12pm on Tuesday, December 11th! For our annual community service project – gift donation for our wonderful friends at Positive Tomorrows! Please see the attached pdf for the Merry Market Wish List 2018! Positive Tomorrows began in 1989 as a collaborative effort of community organizations that recognized the educational needs of homeless children were not being met. Founding partners included Oklahoma City Public Schools, the State Department of Education, CampFire USA, Neighborhood Services Organization and the YWCA. As an affiliate of the OKC Public School System, our purpose was to help homeless families collect needed documentation to enroll their children into a public school. From our founding until 2006, that was what we did. Then, a change in the Federal Grant guidelines caused us to become ineligible for government funding. While many of our students still came from the OKC Public Schools, we were no longer formally affiliated. Today, Positive Tomorrows is a private, tuition-free elementary school meeting the educational needs and social service needs of homeless children and their families!